A message from Governor Philip Hoff in the Council's first Annual Report (one of seven pages). During the 1965 state legislative session, the Vermont legislature passed H.255, An Act to Establish Recognition of the Vermont Council on the Arts, Inc. and to Make an Appropriation therefore. That appropriation was $500 per year for the next two years. In September, 1965 P.L. 89-209, The National Foundation on the Arts and Humanities Act became law. Federal funds of approximately $50,000 per state were to be allotted for conducting surveys, planning, and sponsoring programs on a matching basis. Only the Agency recognized as the official State Art Agency would be eligible to make application for these funds. In November, 1965 an executive secretary was hired by the Council with the charge to open an office in the Capital city and to investigate the application procedure under P.L. 89-209. The Council's first employee was Arthur Williams, a former representative in the legislature. That history, in detail, is contained in the Council's first annual report, published in 1966. 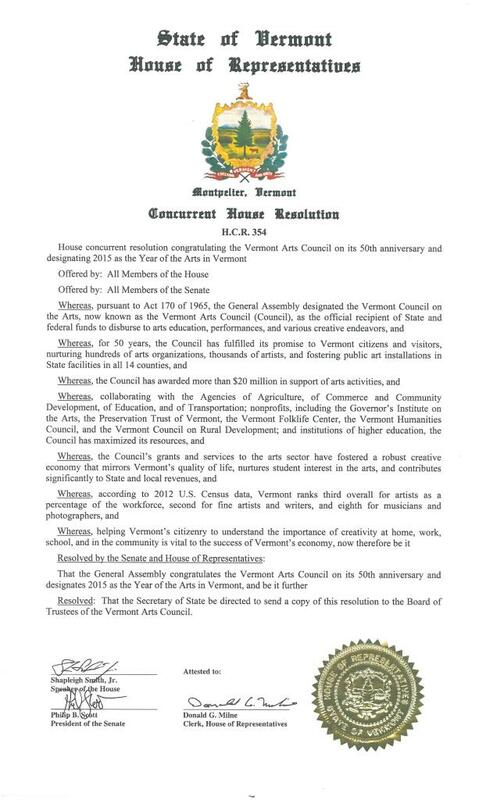 To mark the occasion of 50 years of public support for the arts, the Legislative Arts Caucus spurred leadership of the Vermont House and Senate to create a resolution officially designating calendar year 2015 as the Year of the Arts. H.C.R. 354 was read in the House Chamber of the Vermont State House on May 1, 2014. Big anniversaries inspire serious consideration of the future. The Arts Council first heard many ideas, considered many opinions, then developed three initiatives to support the state's arts and culture sector going forward. Every student in Vermont has the right to learn in, about, and through the arts. Our goal is to transform that right into a reality. Actualizing that right will, in large part, determine both students' creative futures as well as the cultural landscape of our state. 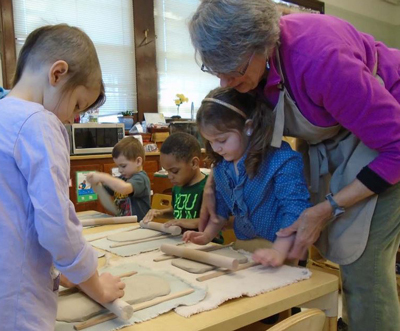 The Council will continue to implement its five-year plan for integrating the arts into the education of every Vermont child. The network is envisioned as a broad collective of organizations, businesses, and individuals all sharing a goal to advance Vermont’s creative sector. The Council aims to make the Vermont Creative Network a strong voice in Vermont’s development. In concert with a community-based steering committee, the Council has begun a strategic planning process that will guide the launch of the Vermont Creative Network in FY2016. A successful marketing campaign—Vermont Arts 2015—became Vermont Arts 2016 and will continue to evolve as the Council works to make art another recognized element of the Vermont brand. The goal is to help visitors and residents alike discover and enjoy the rich creative culture that defines Vermont. The Council will continue to develop its online presence, marketing programs, collaborations, and other communications tools to ensure that when people think of Vermont, they think of the arts.